Newsflash: Bollington Buses will be discussed at the Scrutiny Committee on 19 July, everyone is encouraged to attend to ensure Councillors know our views. On Tuesday 14th June, the Cheshire East Cabinet made the decision to withdraw free school buses from the Bollington area to Tytherington School from April 2017. The cabinet have decided to ignore the concerns of the local community, parents, Tytherington School and the Bollington Town Council on the issue of youngsters walking the Middlewood Way. There has been no opportunity for a full consultation on this matter. 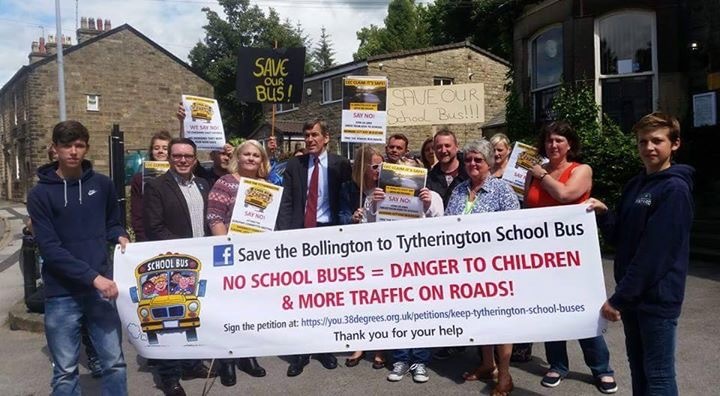 If you would like to show support for keeping the free Tytherington school buses, there is an online petition available at https://you.38degrees.org.uk/petitions/keep-tytherington-school-buses. Now that the decision has gone to the Children and Families Overview and Scrutiny Committee for review on Tuesday 19 July, we want to concentrate our efforts on this meeting. We would like to go to demonstrate at the scrutiny committee on Tuesday 19th July. The meeting begins at 10am and is taking place at The Ballroom, Sandbach Town Hall, High Street, Sandbach, CW11 1AX. We would like to get there early to make our voices heard. We will be there from 9.30am onwards to demonstrate against the decision. Ladyline coaches will provide free transport from the school to the meeting. Please e-mail the school if you would like to come along: info@tytheringtonschool.co.uk. We will be writing to Bollington parents so that students are given an opportunity to come along. Will Tytherington School run its own service if the Council refuses to run buses from Bollington? Yes. If Cheshire East Council refuse to bow to public pressure and change their decision, we will run our own bus service to Bollington from April 2017. This will be at a cost to families, however, we believe that we would have to step-in to ensure that there is an option of transport for families attending the school. We will contact parents with the transports proposals before the end of term. Many thanks for your help and support on this matter.